Lucy is service with a smile! and has gone over and above to work with me to design something I’m delighted with. For a non-technie, she’s been patience and generosity personified with tailor-made tutorial videos to help me and giving me her time to talk through various changes and edits. She understood what I was wanting and has designed something that reflects my needs perfectly. Overall I could not recommend Lucy highly enough. Filed under Testimonials, Web Design, Web Design Enfield, Web Design Hertfordshire, Web Design London, Web Designers in London, Websites, WebSites Herts. Lucy is a great web designer with the greatest patience ... always there to help solve any queries or amend things on the website as quickly as possible .... would highly recommend her to anybody asking about web design. Well what can I say about Lucy’s Web Designs. 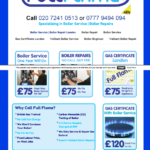 Lucy Designed my Web Site: fullflame.co.uk and it is now on the 1st Page of Google for Boiler Service & Boiler Repair Thank you Lucy for your Great Service. Well, web design and implementation is either your bag or it isn’t. Having spent a few years servicing my own company site I knew it was time for a fresh design perspective and a quick Google search and 1 phone call had the ball rolling with Lucy. Professional, dedicated and a very fast turn around with all questions answered quickly. I high recommend Lucy’s Web Designs. Neither did our company site cost the earth, very attractive pricing point. Nothing is too much trouble for this very patient lady with my endless lists of what happens if… how can I… and can I do this….. And the list goes on. If you ask Lucy to do something, it’s as if by magic, it’s done in no time at all. This is one very efficient lady here. I like the one to one training on how to use your site, and the video for you to watch later, quite amazing. I would highly recommend Lucy. Sue Greenald, Moggies and More Greeting Cards. Have been working with Lucy on our Pub website for some time now. She has been exceptionally helpful. Very reliable and responds to emails very promptly!! She is friendly and patient when working with us and is willing to go above and beyond the call of duty to ensure we receive exactly what we want. She has been the key player in the development of our basic small business website. Very happy with her services. Thank you! highly recommend.